Welcome to the fourth installment of NoVa Caps’ monthly prospect reports for the 2018-2019 Washington Capitals. This report summarizes activities for each of the Capitals’ prospects for the month of January, 2019, and provides an overall “Trending” rating for each player. We also provide a “Top 5 Prospects” ranking for each primary position at the end of the report. You can always check out all of our prospect analysis and reports under the “Prospects” tab in the main menu (above). 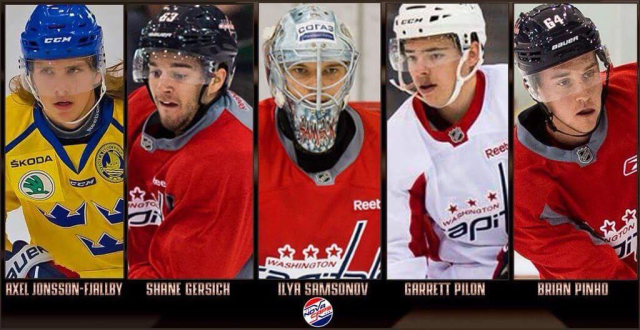 You can also follow the #CapsProspects hashtag stream on Twitter for the latest Capitals prospect news. All news, stats and data were aggregated and compiled throughout the month of January and finalized on, or just prior to January 31, 2018. 2018 was a rough year for the Hershey Bears and it was one the team was glad to see end. However, the change into 2019 has been a positive one for the Bears, so far. After struggling through December, Hershey responded with their best month of the season in January. The Bears went 7-2-0-1 and finished the month on a seven-game point streak (6-0-0-1). The run has lifted Hershey out of last place in the Atlantic Division and has kept their Calder Cup playoff hopes alive. They trail fourth-place Providence by six points, but the Bears have a game in hand. What changed for Hershey in January? For one, they got strong goaltending from rookie Ilya Samsonov. The Russian netminder struggled in the first three months of the season. He changed his number to 35 for the new year and his play has improved. He went 4-0-0-1 with two shutouts in his last five starts. The Bears have also (and finally) received more secondary scoring. While Mike Sgarbossa and Riley Barber continue to lead the Hershey attack, additional players have chipped in offensively. The return of Shane Gerisch from injury has helped, as has improved play from Garrett Pilon and Juuso Ikonen. Beck Malenstyn has started to add offense to his stellar penalty killing and Jayson Megna and Nathan Walker have chipped in on the scoresheet. The team has also gotten an offensive boost from Ryan Sproul on the back-end. The Bears will now look to sustain their momentum in February to make a push for the playoffs. Samsonov changed his sweater number (from No. 1 to No. 35) near the beginning of the month, indicating he felt wearing No. 1 was not good luck for him. He may have been right, as January was a much better month for the highly-touted prospect. Samsonov started the month giving up three goals on 18 shots he faced against Milwaukee, and then gave up two goals on 12 shots in a relief appearance against Springfield on January 11. Samsonov then pitched back-to-back shutouts in his next two starts, starting the following night against Lehigh Valley on January 12 (his first career AHL shutout) and against Binghamton on January 16. Samsonov’s next start would come against Wilkes-Barre/Scranton on January 19. He would give up three goals on 25 shots for the win. Samsonov would win his fourth straight game against Bridgeport on January 21, giving up just one goal on 21 shots faced. Samsonov started a fifth-straight game for the Bears on January 23 at Lehigh Valley, where he stopped 25 of 26 shots he faced in a 2-1 shootout loss to the Phantoms. For the month of January, Samsonov started six games and relieved Vitek Vanecek in one game, giving up a total 10 goals on 136 shots faced, for a .926 save percentage for the month. For the season, Samsonov is 9-11-1-2 with a 3.14 Goals-Against Average and a .878 save percentage. Vitek Vanecek’s workload was reduced in January, making only four appearances in January. He won all three games in which he played. He gave up four goals in his first three appearances in January, but won two of those games, including a 35-save performance in a 6-4 win over Grand Rapids. He actually played very well in that outing, but was the victim of some lackadaisical play after the Bears took a 5-1 lead. His limited appearances were due to Samsonov’s strong play in net. Vanecek did deservedly represent Hershey at the AHL All-Star Classic in Springfield, Massachusetts on January 28. In the All-Star game, he made six saves and allowed no goals for the Atlantic Division in the Championship game, but was pulled for the deciding shootout (his replacement gave up two goals and the Atlantic lost to the shootout 2-1 to the North Division). He played in all four games, surrendering only two goals. Lewington has stepped up since returning from the Washington Capitals. He played well in the NHL and has taken confidence from that experience. He is playing with Aaron Ness again to form a strong first defense-pairing for the Bears. The duo face the opposing teams top scoring line on a nightly basis and they have succeeded. He was a plus-4 in January and is the quintessential stay-at-home defenseman. He is a smart player in his own zone and always stands up for his teammates. If he continues to play this way, another recall to the NHL could be in the future, especially if the defensive struggles of the Capitals continue. Bindulis remains sidelined with an injury. He has not played since November 28. His return is still a ways off. Bindulis, who is making $792,500 this season, will become a restricted free agent at the end of the 2020-2021 season. January was another lost month for Johansen. He missed the entire month with an injury and has not suited up for a game since November 23. Johansen finally returned to practice on Friday, January 25. He is expected to be back after the All-Star break. Hobbs returned from injury on January 11 after being out since December 15. His return was a boost for the Bears. The team has gone 7-1-0-1 since his return, with the loss being his first game back. Hobbs is a good skater and has a very good shot fake, the best among Hershey defensemen. He potted two goals and chipped in with an assist in January. He now has 16 points on the season, equaling his point total from last season. He continues to improve defensively, making better decisions finishing with plus-4 rating for the month. This has been a rough season for Williams. The third-year defenseman has not appeared in a game since January 6. He had one assist in two games and is still “day-to-day”. Ness has been having a really good season, and all a bit under the radar. Offensively, for the month of January, Ness had one goal and 10 assists. For the season, Ness now has three goals and 27 assists in 40 games played. Defensively, Ness remains the Bears’ top defenseman, playing on the top pair with stalwart Tyler Lewington. He is tied with Riley Barber for the most power play assists with 13. He is tied for the AHL lead for assists by a defenseman and ranks ninth in defenseman scoring with 30 points. Ness plays in all situations. He is on the power play and penalty kill units. He is solid in his own end and leads the team with a plus-3 rating. He has been reunited with Lewington and the duo gives the Bears a strong top defensive pairing. Ness could still see another callup to Washington, but at 28 (turns 29 in May), his value will be most appreciated in Hershey. Ness, who is making $650,000 this season, will be an unrestricted free agent at the end of this season. Geisser’s appearance at the World Juniors was cut short due to an upper-body injury. He did appear in a single game. Geisser returned from the World Juniors on Friday, January 4, and participated in practice, making his first start on January 11 against Springfield. In some ways, the month has been good for Geisser’s development, with his minimal experience at the World Juniors, and in other ways, it was a lost month for him. February will be a big month for Geisser. The Capitals signed Geisser to a three-year entry-level contract on March 22, 2018, for $867,000 annual average value. Siegenthaler remains with the Capitals while Christian Djoos continues to mend. Siegenthaler was given formal word from the Capitals last week that he should look for permanent housing, meaning he could be in D.C. for a while. On the flip side, Siegenthaler is the only waivers-exempt blueliner in Washington, so if the Capitals get strapped for a move when Christian Djoos returns, he could be returned to Hershey. Djoos has returned to skating in Capitals practice in the last week, so a move may be on the near horizon. After missing most of December with an injury, Gersich returned to the Hershey lineup against Grand Rapids on January 5. He made an immediate impact by scoring the third goal for the Bears in a 6-4 win. He only tallied one more goal in the month, but his return gave Hershey a needed infusion of speed and made the team deeper up front. The Bears need more offense from him going forward, but his return has been a plus for the team. Early in the season, Gersich struggled in his own zone, but he has improved in that area. Barber remains one of Hershey’s top offensive players. He put home seven goals in January and chipped in with seven assists. The 14 points pushed his season total to 38, which is tied with Mike Sgarbossa for the team lead. He has matched his point total from last season. Barber tops the Bears with 22 power play points. He is tied with Sgarbossa for the most power play goals with nine and with Ness for most power play assists with 13. He had two game-winning goals in January to up his season total to four (tied for the team lead with Liam O’Brien). He was a plus-5 for the month after being minus-10 for the season through December. One area in which Barber can improve is accuracy with his shots. He has taken a team high 139 shots, but has only scored on 18 of them for a shooting percentage of 12.9. Barber is one of three Hershey players to play in all 44 games. December was a quiet month for O’Brien. In a month in which many of his teammates upped their offensive game, O’Brien’s production decreased. He netted one goal in January after scoring five in December. That one goal came on 19 shots, which is a shooting percentage of just .05. He was scoreless in seven of the 10 games in the month and has one goal in his last 18 games. O’Brien is also a team worst minus-14. The rugged winger needs to find more consistency in his game. He has proven to be a very streaky player this season. He has been in the lineup for all 44 games this season and more consistent offensive productivity would benefit the Bears. Not surprisingly, Walker has been an asset to the Bears since returning to Hershey. He is fourth on the team in goals (10) and sixth in points (18), but has played in only 29 of the Bears’ 44 games. He has found a home on the third-line, playing with Beck Malenstyn and Garrett Pilon. Walker is always a potential call-up for the Caps, but will always have to clear waivers, which makes it difficult. Walker is making $650,000 this season, and will be an unrestricted free agent at the end of the year. Hampus Gustafsson – C/LW – Undrafted – 25-years old. Gustafsson has seen consistent playing time this month, locking down the fourth-line center position, with Max Kammerer and Juuso Ikonen his regular linemates. As noted, the fourth-line has been an asset for the Bears in January, and in certain games, has energized the team, particularly earlier in the month before the team’s performance improved. However, Gustafsson was held off the scoresheet for all 10 games he played in January. For the season, Gustafsson has no goals and just two assists in 29 games played. January was a strong month for Pilon. He amassed seven points, a goal and six assists, to run his season point total to 18. More importantly, the pivot has improved his game in his own end. His back-checking has gotten a lot better. He was a minus once in 10 games in January. In December, he was a minus seven times. January was the first month in which he finished with a plus rating (plus-3). This improvement has allowed Pilon to gain more ice time because the coaching staff is starting to trust him on both ends of the ice. He has been a steady presence in the lineup, as he is one of three players to suit up in all 44 games. Kammerer has found a home on the fourth-line with Gustafsson and Juuso Ikonen. Kammerer played in six games in January with no goals and two assists, but he has definitely improved his game since the last report. February will be a big month for Kammerer and the fourth-line. Bau returned to Hershey in mid-January, and met with doctors. He has yet to return to practice, or even skate, so the remainder of season is becoming more and more doubtful. Bau, making $700,000 this season, will be a restricted free agent at the end of this season. Mitchell has not played a game since December 30 against Providence. For the season, Mitchell has no goals and one assist in 11 games played. Mitchell, making $883,750 this year, will be a restricted free agent at the end of this season. Pinho has been playing a lot on the right wing lately, with Hershey’s lack of depth in that position. He has taken to the move well. He entered January with a single goal, but scored twice in the month to increase his goal total to three. He added an assist as well. Three points in a month may not seem like much, but it is the highest point total Pinho has put up in a month this season. It is a step in the right direction for the rookie from Providence. Ikonen began to find his game in the month of January. His low-to-high passing and ability to find free space around the goal is readily apparent. He is simply figuring things out. For January, Ikonen had two goals and three assists playing on the fourth-line. On the season, Ikonen has three goals and eight assists in 33 games played. Sgarbossa continues to deliver offensively for Hershey. January was another big month for the pivot. After posing 11 points in December, he netted five goals and added eight helpers in the January. He has already set a career-high in goals with 20, surpassing the 19 he had as a rookie with Lake Erie. The 20-goal total leads the Bears. Sgarbossa is tied for the team scoring lead with Riley Barber with 38 points. He is also tied for the team lead with nine power play goals and is second on the squad in power play points with 13. He was also a plus-3 for the month after being a minus-11 through the first three months of the season. Sgarbossa is the team leader in shooting percentage, converting 20.6% of his shots (20 of 97). Megna’s scoring continued to cool in January. He had did have a two-goal game against Wilkes-Barre/Scranton (his former team) on January 19. Other than that, he had three assists in 10 games played in January. For the season, Megna has nine goals and 11 assists in 49 games played. Six of his nine goals have come against his former team, the Penguins, so it feels like he has it in him, but just needs some kind of inspiration for games. Alexeyev had an impressive showing at this year’s World Junior Championship in Vancouver, British Columbia (recap is here). Alexeyev had two goals and four assists in seven games played. He totaled 12 shots for a shooting percentage of 16.7% for the tournament. He totaled 10 PIMs, registered one power play goal and one game-winning goal, and was a plus-9. Alexeyev returned to Red Deer starting on January 9. Alexeyev suffered another injury in a game against the Calgary Hitmen in January 19. He left the game, but returned to finish the game. However, he was scratched the following night against the Hitmen and against Medicine Hat on January 25. He also missed the remaining two games of the month. According to local sources, Alexeyev has been seen with his shoulder in a sling, and it looks like he injured the same shoulder he injured last season. He remains listed as “week-to-week”. For the month, Alexeyev played in just five games for Red Deer, registering no goals and six assists. Alexeyev’s decline in goal production is not related to a systemic change by the Revels mid-season, as Alexeyev’s shot production has remained consistent this season. For the year, Alexeyev has seven goals on 90 shots for a 7.7% shooting percentage. Defensively, Alexeyev’s game remains strong, but the physical level of play may be catching up to him a bit, sustaining two significant injuries recently. February will be an important month for Alexeyev and the pursuit of the next step in his career. Sutter has been sidelined since sustaining a “lower-body injury” in the second period against Prince George on December 29. He was seen walking with crutches after the injury with a boot on his left foot. He has been listed as “week-to-week”. The latest update from local sources (last week) was that Sutter is still on crutches and “it will be a while, still”. Prior to his injury, Sutter had 14 goals and 27 assists in 38 games played. He had 125 shots for a 11.2% shooting percentage. Sutter signed three-year entry-level contract for an average annual value of $817,500 back on September 29, 2018. Florchuk spent time earlier in the month at the second-line right wing position, but was moved to third-line center and has settled in there. Florchuk was held off of the scoresheet for five consecutive games from the end of December to the first three games of January but tallied one goal, four points, and 12 shots on goal on a three-game point streak following that little scoring slump. After getting held off the scoresheet in a 5-4 loss to the Portland Winterhawks on January 12, the center posted three goals and five points in four games, though he had a minus-1 rating in that span. He posted four and six shots on goal two and three times in January, respectively. After winning one out of two faceoffs in the first five games of the month, he won 41 out of 70 (68.3%) in the last six games of January. He did a nice job of staying out of the penalty box, earning just six penalty minutes this month. After going on a seven-game point-streak, where he tallied three goals, eight points, and a plus-3 rating, Roykas-Marthinsen was held off of the scoresheet for four consecutive games and was limited to only four shots in that span. He was also held scoreless in eight of the final nine games of the month, though he posted a goal and two points on January 11 in a 4-3 overtime loss to the Calgary Hitman, the lone game he was able to contribute. Roykas-Marthinsen was sent to the penalty box only once and did not take any faceoffs during the month of January. He posted 21 shots and had at least three shots in a game four times this past month. After getting held off of the scoresheet in the first two games of January, Kannok-Leipert tallied assists in back-to-back games and had an impressive+5 rating in the second game, a 7-4 win over the Kamloops Blazers on January 12. Since that game, Kannok-Leipert has been held scoreless in seven consecutive outings but has a +4 rating in that span. He had consecutive games with four shots on goal in a 5-4 overtime win over the Tri-City Americans on January 16 and a 6-4 win at the Spokane Chiefs on January 18. After that, he got called for a penalty in consecutive games. In the final four games of the month, he was relatively quiet, earning just a +1 rating and three shots, two of which came in the final game of January. Clark had missed most of the month of December with an injury but returned on December 28. For the month of January, Clark played in nine games and had one goal and nine assists. He scored his goal for this month in the game on January 19 in a 5-3 victory at home for the Ottawa 67’s against the Hamilton Bulldogs. While he scored only one goal during January, he has racked up the assists. Clark had two consecutive games of racking up two assists, one on January 11 against the Sarnia Sting and one on January 12 against the London Knights. He ranks sixth for the team in goals with 13 but is only three goals away from third on the team. Clark ranks eighth on the team in assists and eighth in total points. There are numerous forwards on the team vying for playing time, given that the 67’s have acquired two more high scoring forwards for their lineup. Lucas Chiodo and Kyle Maksimovich, in preparation for trying to earn the OHL Championship. The Rays are tied with the Jacksonville Icemen for second place in the ECHL’s South Division with an overall record of 23-17-2 and 48 points. Milner spent most of January dealing with an injury. In his first game action since December 8, Milner stopped 36 shots in his return to action on January 27 and helped the Stingrays hold off their in-state rival, the Greenville Swamp Rabbits by a score of 2-1. On the season, Milner is 9-5-0 with a 3.00 GAA average and a .909 save percentage. On the season, Morrison is 4-4-0 in nine games played, with a 2.85 Goals-Against Average and a .890 save percentage. Priskie was nominated for the 2019 Hobey Baker Award on January 16 (here). Nominated players were submitted by the athletic departments of the Division I men’s hockey schools with a maximum of three candidates from any one school. There are four criteria against which nominees for the Hobey Baker Memorial Award are considered: 1) Strength of character, on and off the ice, 2) Contribution to the integrity of the team and outstanding skills in all phases of the game, 3) Scholastic achievement and sportsmanship, and 4) Compliance with all NCAA rules, including being a full-time student in an accredited college or university and completing 50 percent or more of the season. On the ice, in January, Priskie had a goal and five assists in six games played. For the season, offensively, Priskie has 13 goals, which leads all Bobcats and is 13th in the nation, 16 assists, which is third on the team, in 24 games played for a 1.21 points per game average. Priskie leads the nation in power play goals (8) and is 8th in the nation in total points. He’s taken 91 shots for a 14.3% shooting percentage. After a slow 1-6-3 start to the season, the young University of New Hampshire squad (e.g., nine Freshmen, eight Sophomores) has gone on a 8-2-5 tear since late November. Sophomore defenseman Benton Maass, who missed the final two games in November and four more in December with a shoulder injury (more on injury here), returned to the UNH lineup on January 4. In his first game back, a 2-1 win over Merrimack College, Maass’ play was as solid as it had been before the injury. He initiated the game-tying play by carrying the puck to the top of the faceoff circle and snapping a wrist shot, nearly beating the Merrimack goalie on the low side. Maass registered three shots on goal, three blocked shots, and a plus/minus rating of plus-1 in the winning effort. Since his return, Maass has played in eight consecutive games, tallied one assist, had eight shots on goal and 22 blocked shots, and an even plus/minus rating. The Wildcats are 4-1-3 during that stretch. Among all UNH defensemen, Maass has the most blocked shots (2.2 per game) and fewest penalties (two minors over 19 games). The UNH penalty kill is the second stingiest in Hockey East with 86% efficiency and Maass plays right defense on UNH’s first PK unit. In short, Maass is a mainstay for UNH in the defensive zone. In the month of January Jonsson-Fjällby was noted for three assists in nine games with Djurgården, and averaging about 13 minutes per game, top 9 minutes. No real improvement, nor the opposite during the last month. For the season, since returning to Djurgården, he has no goals and six assists in 21 games played, down from his offensive production in Hershey. Hopefully his production starts soon, but so far, not so good. Since returning from World Junior duties, Fehervary has continued being a part of the 7-man defense that HV71 rotates with each game. Yes, in European hockey, teams usually dress a 13th forward and a 7th defenseman, which are always free to play. In these games the Slovakian produced one assist, but as a season ticket holder with HV71, who sees all his games, I must say that he is looking very good, even though he doesn’t put up a large amount of points. Fehervary is a good skater, who isn’t afraid to join the rush or use his body. Most of all he looks rock-solid in his own zone, and often wins one-against-one duels. As a d-man, it usually is harder to develop a defensive game later in one’s career, then getting better offensively. I’m confident that the production will come, and bear in mind that the guy is playing against seniors. Walfridsson has continued to play in both J20 SuperElit and in the senior team, with no real improvement since last month. In total the d-man has represented MoDo in 17 games, averaging under 9 minutes per game, mostly sitting on the bench. The former junior national team player continues to worry, and desperately needs playing time against men in order to take the next step. Riat has continued to be a vital part of the Biel team, who are doing well in NLA. Currently the Swiss winger ranks fifth in the team in scoring, with 19 points in 37 games, averaging about 15 minutes per game on the ice. He is also playing on the powerplay, in company with former NHLers like Damian Brunner and Marc-Antoine Pouliot. Riat may be 21 years old, but it’s easy to say that he has adjusted to senior hockey in a good way this season and continues to do well. It would be interesting to see him try on play across the pond next season. This entry was posted in News, Propsects, Roster Moves and tagged Aaron Ness, Alex Alexeyev, Alex Kannock-Leipert, Axel Jonsson-Fjallby, Beck Malenstyn, Benton Maass, Brian Pinho, Capitals Prospects, Caps Prospects, Chase Priskie, Colby Williams, Connor Hobbs, Damien Riat, Eric Florchuk, Everett Silvertips, Garrett Pilon, Hampus Gustafsson, Hershey Bears, Hv71, Ilya Samsonov, Jayson Megna, Jonas Siegenthaler, Juuso Ikonen, Kody Clark, Kris Bindulis, Kristian Roykas-Marthinsen, Liam O'Brien, Lucas Johansen, Martin Fehervary, Mason Mitchell, Mathias Bau, Max Kammerer, Mike Sgarbossa, Riley Barber, Riley Sutter, Saskatoon Blades, Sebastian Walfridsson, Shane Gersich, South Carolina Stingrays, Tobias Geisser, Tyler Lewington, Vancouver Giants, Vitek Vanecek, Washington Capitals Prospect Report. Bookmark the permalink. Doesn’t look like we have that young defensive player ready to make his impact on the big club And upon further review not even one good young offensive player who could make a difference on the Capitals team presently. Looks like trades in the offering! . Bummer on injuries occurring in WHL. Just curious, why do you write that a minor league AHL player like Bindulis is making $792,500 when that’s only his NHL salary (where he has never played)? He’s been making $70,000 for the Bears.